The Maidenhead of Jawza’ represents the virginity (or the hymen itself) of the female figure of Jawza’. In the earliest times, the name “Jawza’ ” referred to only the three bright stars that are lined up in the middle of the figure. 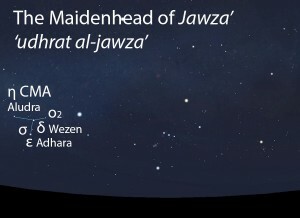 The Maidenhead of Jawza’ (‘udhrat al-jawza’) as it appears in the west about 45 minutes before sunrise in early December. Sky simulations made with Stellarium. A grouping of 3-4 bright stars arranged in a triangle around a central yellow star. The grouping lies below the Shi’ra Who Crossed Over and to the east of the Rear Footstool. Al-Sufi says the grouping is comprised of the 4 brightest stars of the group (δ, ε, η and ο2); Ibn Qutayba says there are 5 stars, the fifth one being of uncertain identification but most likely σ. The Maidenhood of Jawza’ does not figure in the calendar of the rains stars. The Maidenhood of Jawza’ does not figure in the calendar of the lunar stations. 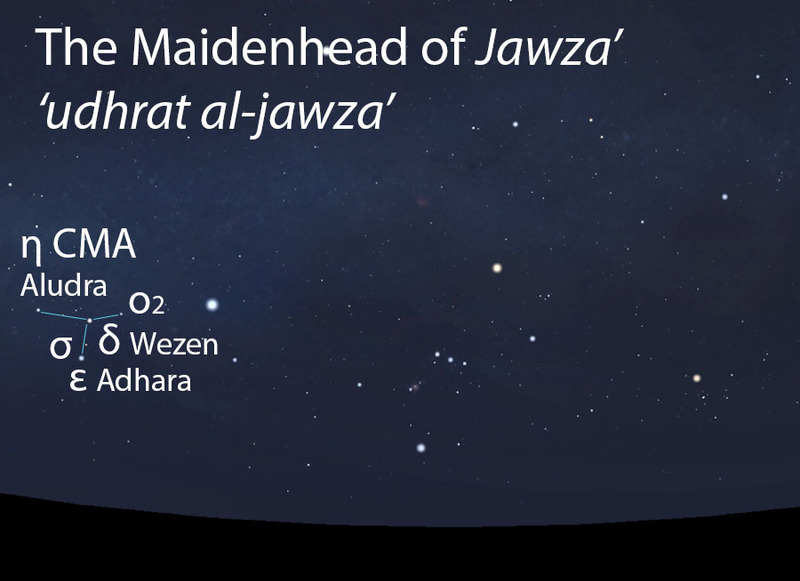 The Maidenhood of Jawza’ is part of the Jawza’ (al-jawza’, الجوزاء) folkloric celestial complex, which developed over time from the central stars that mark her Belt of Pearls.